Anti-NATO protesters in streets of Europe, U.S.
BELGRADE, Yugoslavia (CNN) -- The pilot of a NATO warplane down in Yugoslavia has been rescued, senior U.S. officials told CNN late Saturday. Yugoslav authorities had claimed they downed a NATO warplane Saturday, as NATO unleashed a fourth day of airstrikes on Yugoslavia. Serbian television Sunday showed video of what it said was a F-117A Stealth Nighthawk that had been shot down by Yugoslav forces. According to Yugoslav state TV, the plane went down approximately 40 kilometers west of Belgrade about 10 p.m. local time (4 p.m. EST). 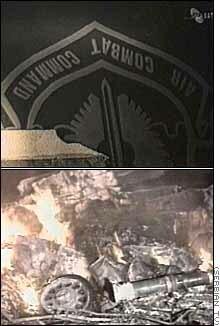 Serbian television pictures showed burning wreckage with the aircraft's identification number, AF-806, clearly visible. A stealth fighter with the number AF-806 appears in a photo on a U.S. Air Force web site on the Internet. Chris Uhles, a spokesman at Holloman, told CNN all F-117 fighters are from Holloman Air Force Base in New Mexico. Also in Belgrade, Yugoslav officials showed international journalists what they said was damage to non-military targets from the NATO bombing and said its air defenses remained intact. CNN's Brent Sadler was taken to a factory in Rakovica, just west of Belgrade, which Yugoslav officials said was hit by a cruise missile. The large facility, which the officials said manufactures engines for civilian vehicles, appeared heavily damaged, with hundreds of its windows broken out. Nearby, a family with three children huddled in an air raid shelter. The father said he was a worker in the engine factory. The local media has reported that the attacks damaged schools, homes and hospitals. Sadler was also shown a military communications site in Rakovica, which Draskovic said had been struck daily since the NATO bombings began last Wednesday. Yugoslav officials said there were military casualties from the bombings, but did not specify how many. The chief of the Yugoslav Army information service said at a news conference Saturday that Yugoslav air defenses remained in good shape despite the bombings and could still shoot down NATO aircraft. Fireballs have lit up the night sky in Belgrade since the attacks began and a forest near a popular suburb has been set ablaze. Residents have for the most part deserted the city's streets and headed for underground shelters. Fuel has been restricted to essential services. City buses and trams are still running, but with few riders. Air raid sirens also went off Saturday in Podgorica, the capital of Montenegro. The pro-Western Montenegro, which along with Serbia is one of two republics making up the Yugoslav federation, has tried to remain neutral during the airstrikes. 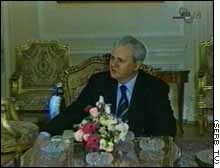 Montenegrin President Milo Djukanovic has accused Yugoslav president Slobodan Milosevic of dragging the country into a pointless war. The NATO Stabilization Force base at Tuzla, Bosnia-Herzegovina, also went on alert early Saturday when two Yugoslav helicopters were spotted heading toward Bosnian air space. "Our early morning system picked up two helicopters heading into the east approaching Bosnian air space and we immediately took defensive measures," said U.S. Major Tom Evans. The helicopters did not cross the border. 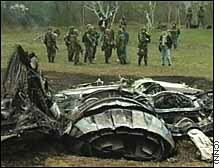 A total of five Yugoslav planes had been shot down, according to NATO officials. Correspondents Jim Bitterman, Brent Sadler and Tom Mintier contributed to this report.